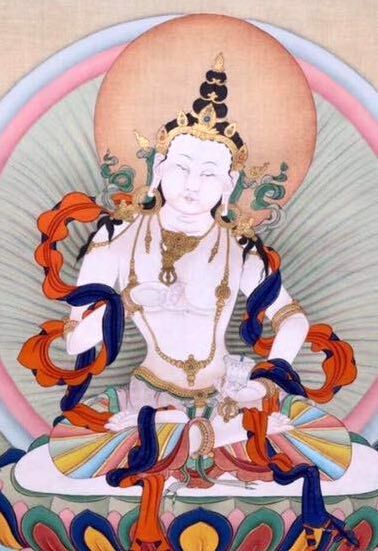 Samantabhadra (manifesting as Vajradhara) transmits the ‘Enlightened Intention of the Buddhas’ to the Buddhas of the Five Families and their mandalas, of whom Vajrasattva is the sovereign. Presiding over mandalas of an inconceivable ocean of buddhas, the Five Buddhas are inseparable from Samantabhadra – without the duality of one who guides and someone to be guided – being the self-display of the same primordial realisation. At the same time, the Buddhas of the Five Families communicate the teachings to the immeasurable mandalas of buddhas that surround them, without relying on words or symbols.